The next standalone novel from Nicole Jacquelyn about love, friendship, and forgiveness. Henry Harris was living his dream as a staff sergeant in the Marines. When he's killed in action, his devastated family is in for one more shock: he had a daughter they never knew about. Morgan Riley has been raising Etta on her own, and that's always been fine by her - until Henry's brother Trevor arrives on her doorstep, willing to do anything to help and make up for his brother's mistakes. Their attraction feels wrong, but Morgan can't seem to turn him away. Trevor is suddenly in too deep. He has always wanted a family, but Etta and Morgan come with complications. Yet as Etta brings them closer together, Trevor begins to imagine giving Morgan and Etta the life his brother never could. But he wonders if Morgan will ever learn to trust another man with her heart, especially a man whose last name is Harris. The Fostering Love series is a treasure I stumbled upon when I picked up Heart of Glass. Nicole Jacquelyn pulls on the heart strings as a single mother comes into contact with her daughter's other family. When Etta's father's adopted brother pays a visit on behalf of the family, Morgan must decide whether she's willing to let them in. Readers will dive into this blend of romance and family drama with gusto and finish in record time! The characters in this story are all struggling to return to normal life after the death of Henry Harris. For Trevor, it means cleaning up the mess his little brother left when he kept his own daughter a secret and left Morgan to raise her alone. At first glance I thought this would be a complex tale, but it's quite straightforward. The most complicated it gets is when Trevor and Morgan fight their attraction and attempt to sort out their feelings. Morgan and Trevor both have backgrounds in foster care, but time and experience turned out two opposite natured individuals. She refuses any offer of help, and won't ask for it, while Trevor is always looking for a chance to give a helping hand. I love that their differences were directly opposing because it made for an interesting read to see how they would work it out on top of their complicated family structure. There's a lot of tension between Trevor's mom and Morgan that stems from the loss of Henry and Morgan's fear of not being a good enough mom. I love that it wasn't glossed over or resolved easily because forming family connection is always a piece of cake. Jacquelyn adds a heavy dose of reality to her writing that will draw in readers from any background. 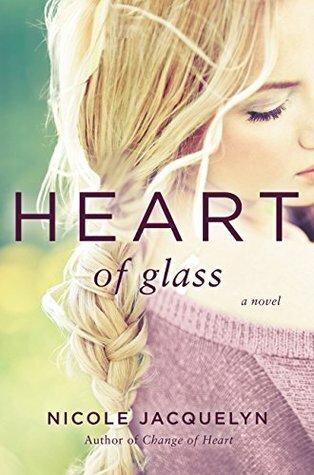 Heart of Glass, and the companion novels of the Fostering Love series, is perfect for fans of Jamie McGuire or Catherine Bybee! Welcome to the Wedding from Hell!